Restaurant for Two: a new feature where I bring a friend to a restaurant and we write a review together. Thanks to the ladies at IMR Chicago for joining me at Piccolo Sogno! 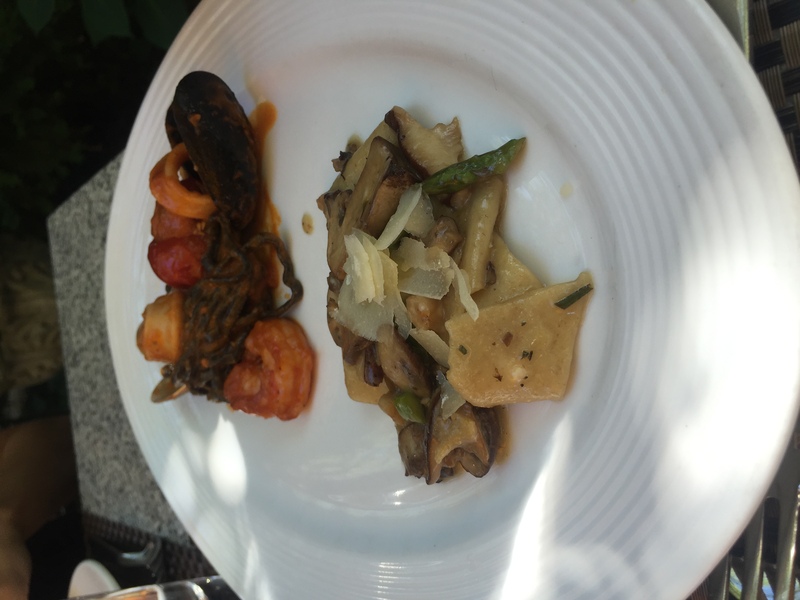 My fondest memory of the week I spent in Italy is of the food. Creamy pistachio gelato. Pizza just pulled from the fire. 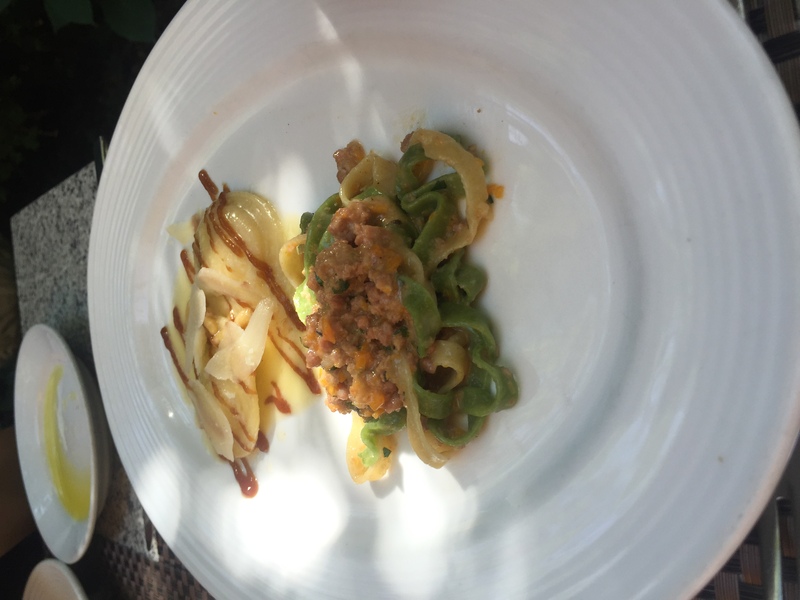 Fresh homemade pasta that melts in your mouth – this is what I miss the most. It has been 12 years of dreaming of the perfection that is Italian pasta. Until I went to Piccolo Sogno. All of the pasta dishes Piccolo Sogno are handmade and fresh. Simply put, they are delicious. With a handful of options, everyone will leave feeling sufficiently stuffed and extremely happy. The food is seasonal, so meals change throughout the year based on what is fresh and exciting at the moment. 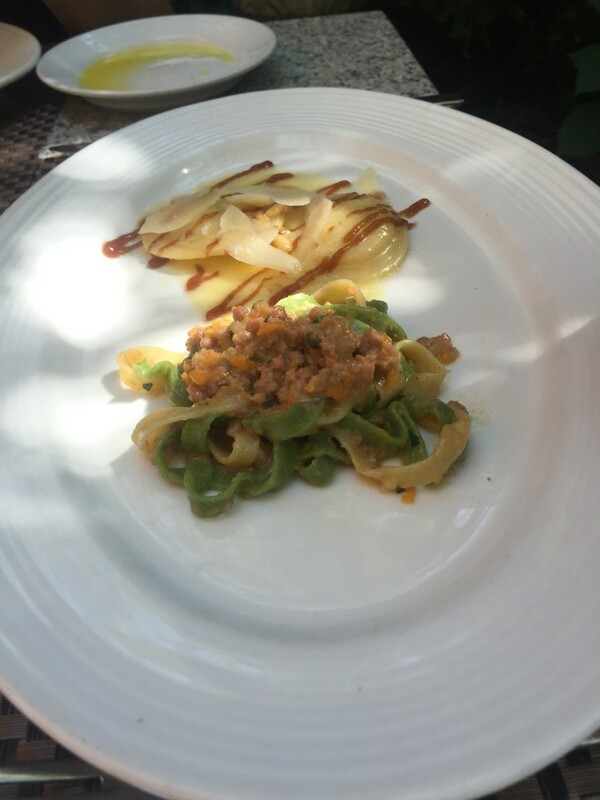 I recently went to a pasta tasting at Piccolo Sogno, so this piece is only a review of their noodle dishes. The menu here is extensive and ranges from hand-tossed pizzas, to fish dishes, paninis, and even homemade desserts. Most importantly, their wine list is extensive with over 400 all-Italian selections. While I only ate pasta this time around, I have every intention of returning to indulge on fresh gelato while sipping on a glass of vino. To give you an idea of what the food is like I have provided a short review below. My favorite dish of the meal, the name means straw and hay in Italian and is named after Monet’s Haystacks series. The bed of long ribbon noodles were really an accoutrement to the sumptuous veal ragu smothered on top. Another top contender, the ravioli had a hint of sweet in the Marsala glaze striped across the four cheese pasta. Pine nuts were added to give both a nutty flavor and a crunch factor. Butter and parmesan shavings topped off this delish dish. For the seafood lovers out here, the spaghetti neri is for you. The string cut black spaghetti (which to me is also a novelty) was flanked by clams, mussels, shrimp, and calamari. All of the meat was tender and seasoned with a light hand. The steamed tomatoes and red pepper complemented the seafood perfectly. A vegetarian-friendly dish, the Farro flour pasta was doused in truffle oil – another favorite of mine. Farro is not wheat, but a grain that has a nutty taste, similar to oat and barley. An abundance of mushrooms and asparagus were mixed in with the wide noodles. And who doesn’t love a meal with big shavings of parmesan adorning the top? This dish was a first for me with wild boar as its protein. I was surprised at how tender and juicy the meat was. 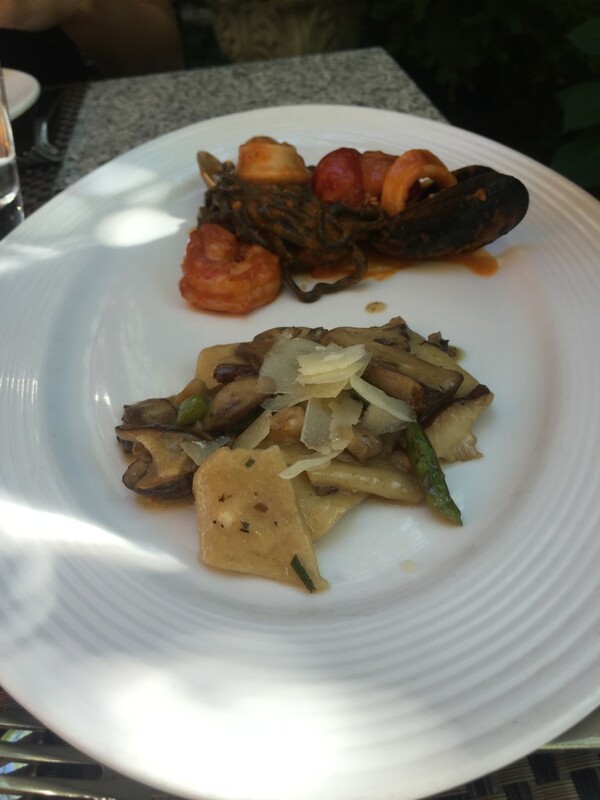 The wide and flat pasta was also paired with rustic vegetables like celery and carrots. 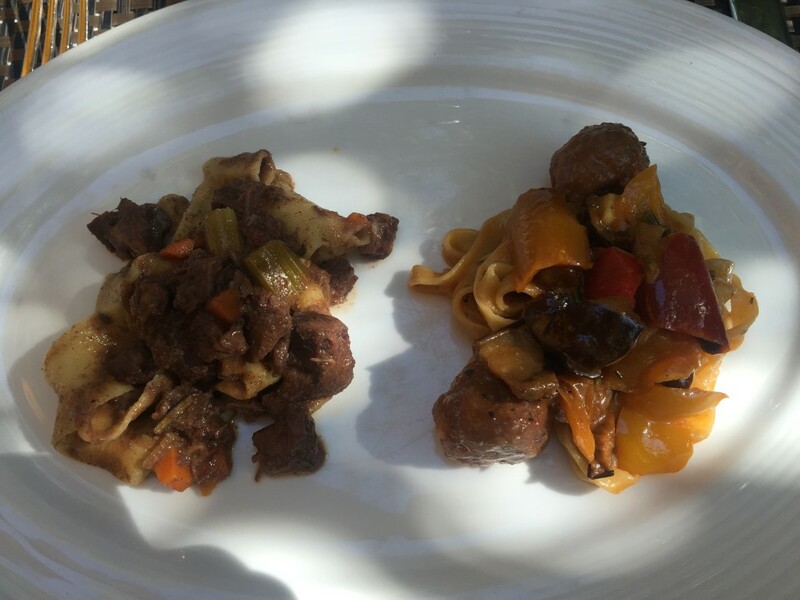 A simple pasta dish with eggplant and peppers was elevated with flavorful lamb and pine nut meatballs and topped with a ragu of roasted peppers, green onions, and eggplant. This is a seasonal dinner dish which means that it is only around for a limited time. **Everything listed here may not necessarily be available when you finish drooling over this review and hop on the blue line to Piccolo Sogno. So make sure to get in there and see what everyone at Piccolo Sogno is cooking up.